Advent Sunday, also called the First Sunday of Advent, among the Western Christian Churches, is the first day of the liturgical year and the start of the season of Advent. In Lutheran, Anglican, and Methodist churches the celebrant wears violet-coloured or blue vestments on this day, and the first violet or blue Advent candle is lit at Mass. In the Church of Sweden, a Lutheran national Church, the Liturgical colour is specifically white: the motivation is that the day is a joyful feast (the colour is changed to blue, the traditional colour for Advent in Scandinavia, or—if the church does not possess blue vestments—violet after 6 p.m.). Zechariah 9:9–10 and Matthew 21:1–9 are always read in the service, and the symbolism of the day is that Christ enters the church. Likewise, in the Roman Rite of the Catholic Church, Advent also "begins with First Vespers (Evening Prayer I) of the Sunday that falls on or closest to 30 November and it ends before First Vespers (Evening Prayer I) of Christmas". Purple vestments are thethe liturgical colour of the whole Advent season. However, in the Ambrosian Rite and the Mozarabic Rite, the First Sunday in Advent comes two weeks earlier than in the Roman, being on the Sunday after St. Martin's Day (11 November), six weeks before Christmas. Advent Sunday is the fourth Sunday before Christmas Day. This is equivalent to the Sunday nearest to St. Andrew's Day, 30 November, and the Sunday following the Feast of Christ the King. It can fall on any date between 27 November and 3 December. When Christmas Day is a Monday, Advent Sunday will fall on its latest possible date. 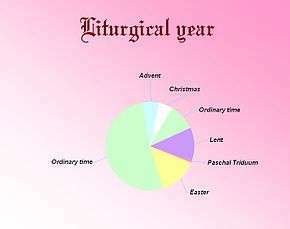 Note that it is also possible to compute the date of Advent Sunday by adding three days to the date of the last Thursday of November; it can also be computed as the Sunday before the first Thursday of December. Look up advent sunday in Wiktionary, the free dictionary. ↑ Oxford English Dictionary. Second edition, 1989. 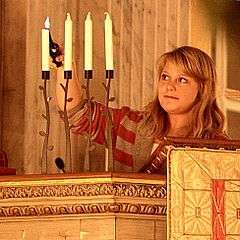 "Advent Sunday, the first Sunday in Advent, the Sunday nearest to the thirtieth of November."